The sleeve of a drill press or lathe headstock in which the spindle is mounted. On the vertically mounted drill-press, the quill moves up and down; on the horizonitally-mounted drill press, and the lathe, the quill moves back and forth. The quill -- which does not rotate -- serves a cylindrical housing to keep the spindle secure as it rotates. The quill usually has teeth in which a pinion engages to control the movement. Source: adapted from Home Craftsman 4 January-February 1935 page 124. The hollow steel mandrel of a seal-engraver's lathe, into which the engraving tools are fitted. The quill is of steel, about 2 inches long and inch in diameter. A hollow sleeve rotating in bearings which is used to transmit the drive from a motor to a concentrically-mounted axle. A gearless concentric motor for each driving-axle is mounted on a quill flexibly connected to the driving-wheels. 1930 Ibid. 6 June 722/1 Two new types of drive had been developed... The first consisted of a geared quill surrounding the driving axle and carrying two crankpins, the latter being connected by a flexible linkage to two crankpins on the driving wheels. A certain amount of experimental work has been carried out with the motor armature shaft of the hollow or quill pattern. The spindle rotates in the quill to provide the rotary motion for cutting tools. ... The quill, together with the spindle, is moved up or down either by a single bar or by a wheel having three or four spokes or bars with a ball on the end of each. The quill has a stroke or travel from 3" to 4", Fig. 3. It is automatically re-turned to its normal position by a spring. Machines for production work are equipped with a power feed or treadle arrangement. Source: Milton Gunerman, How to Operate Your Power Tools New York: Home Craftsman Publishing Corp., 1950, page 41; the image on the left comes from the same page. The original definition was couched in rather confusing terms, so I tried to clean it up a bit. I admit greater interest in the origin and background history of "quill" than most terms of woodworking. cabriole and Windsor chair are other woodworking terms that are different, perhaps because of the history underlying their coinage. Quill, in particular, stands out. "Hollow sleeve that houses a rotating spindle" seems simple enough, I guess, until you begin thinking about how the term quill was applied to the concept of a sleeve for housing a spindle. After a fruitless search in etymology dictionaries, and the like, I have concluded that no one has speculated on the origin of the meaning of quill as a sleeve. I have a theory though, even if it sounds far fetched. Think of a old timey pen, fashioned out of a feather. 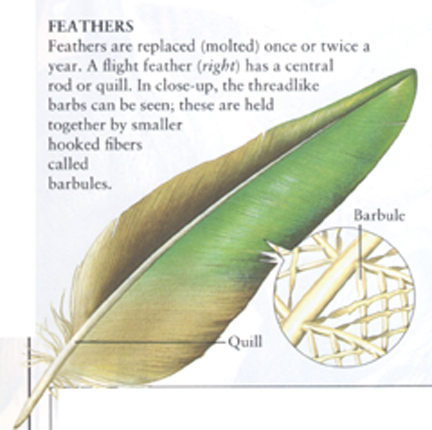 The feather's central component, (ie, the harder, central element that grows out of a bird's body and gives support to the feather) is hollow, and with its hollowness, and that it can be sharpened, means that feathers can be used as crude pens. This fact was discovered many generations ago. I claim as a new machine the combination of the mechanism for operating the awl, peg driver, and for feeding the work, with the mechanism for cutting and feeding the peg work, all being arranged compactly in the frame, A, or its equivalent, and operated by the cams and levers, arranged substantially as and for the purposes described. I also claim the pendulum or stying piece, H, having the awl and peg-driver carrier. L, the throat piece, b, the peg box, W, the pointing mechanism and pegwood feeder, arranged and applied thereto, or connected therewith, as set forth, in combination with so applying such pendulum to a quill or sleeve, F, disposed on the driving shaft, B, or on a stud or arm arranged just above or below the same, that s whole may be caused to operate together in manner and for the purpose set forth. I also claim combining and arranging with a vibrating peg box and peg-wood feeder, constructed as described, a stationary knife, whereby the pegs are severed from the peg strip, in manner as set forth. I claim so constructing and applying the throat piece or block to the pendulum, H, as to have no vertical movement, in combination with so forming and applying the retainer that it may have a short vertical movement, whereby the two are made to operate together in manner as set forth. Source: Scientific American, New Series, Volume 6, issue 8, February 22, 1862, page 125. Two years later, when the Shopsmith Mark IV his the market, DeCristoforo updated his first edition to reflect the changes the Mark IV contained. And in 1955 edition of Power Tool Woodworking for Everyone, expands on his explanation of the mechanics of the quill on the drill press and othe similar woodworking tools with headstocks. Slide the tailstock back on the bed to the required distance to take the stock between the centers. Place the left end of the stock on the spur center and raise the opposite end so that the point of the dead center will enter the center hole in the stock when the tailstock quill is run forward by turning the handwheel or crank. Source: W. Clyde Lammey, Power Tools and How to Use Them Chicago: Popular Mechanics Press, 1950, page 59. Sources: Home Craftsman 4 January-February 1935; R J DeCristoforo Power Tool Woodworking for Everyone New York: McGraw-Hill, 1953.